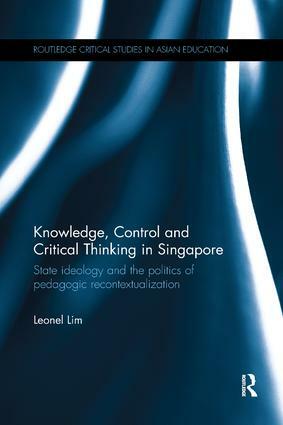 This book examines how critical thinking is regulated in Singapore through the process of what the influential sociologist of education Basil Bernstein termed "pedagogic recontextualization". The ability of critical thinking to speak to alternative possibilities and individual autonomy as well as its assumptions of a liberal arrangement of society is problematized in Singapore’s socio-political climate. By examining how such curricular discourses are taken up and enacted in the classrooms of two schools that cater to very different groups in society, the book foregrounds the role of traditional high-status knowledge in the elaboration of class formation and develops a critical understanding of post-developmental state initiatives linked to the parable of modernization in Singapore. This book will appeal to scholars in comparative education studies, curriculum studies and education reform. It will also interest scholars engaged in Asian studies who are struggling to understand issues of education policy formation and implementation, particularly in the areas of critical thinking and other knowledge skills. Leonel Lim is Assistant Professor at the Curriculum, Teaching and Learning Academic Group, National Institute of Education, Singapore. His research focuses on the sociology of curriculum, the politics of education, state power, and elite schooling. In 2014 he was the recipient of the American Educational Research Association's Outstanding Dissertation Award in curriculum studies. His current projects include an edited volume (with Michael W. Apple) on the politics of curriculum reform in strong states in Asia (Routledge). In Asia, schooling, teaching and learning are undergoing major changes as a consequence of wider economic, social, cultural and political movements. The success of some Asian countries in international education benchmarks has redirected attention to the region. This is counterbalanced by other countries that are struggling to educate their citizens in the midst of political instability, ideological and religious tensions, poverty and natural disasters. In spite of such broad differences across countries in Asia, pioneering and innovative research is being conducted that is of increasing interest to researchers, practitioners, policymakers, and governments worldwide. The Routledge Critical Studies in Asian Education book series will examine key theoretical and empirical research on the changing institutional and cultural contexts of Asian education. The series aims to establish a strong platform for the critical discussion of educational practices and pedagogies in Asia, and is open to Asian and international researchers with a focus on the region. Interdisciplinary research is welcomed, including education, social sciences, psychology, organisational studies, economics, history, political science, cultural studies, and language and literacy.